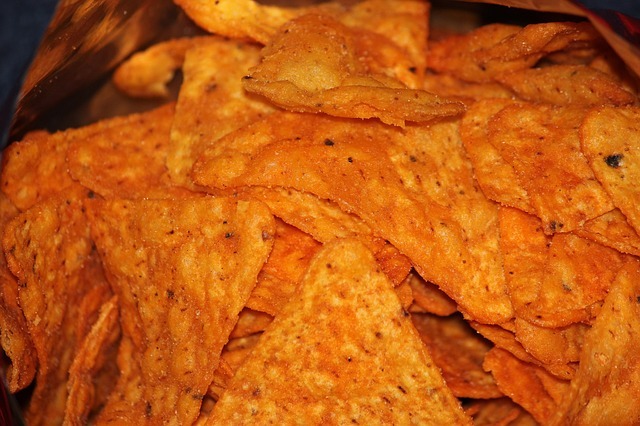 Can I eat Doritos (chips) while pregnant? Can I eat Doritos while pregnant? Pregnancy is filled with all kinds of food cravings, and which pregnant woman has not wanted to tear into a bag of delicious chips and munch away to glory? There is nothing wrong with that, mind you, although it is certainly not okay to live on them. Doritos is one of the most famous (or notorious, depending on your take on the entire fast food industry) brand of packaged chips that are out there. They come in a variety of flavors, and each one is more delicious than the next. It is not really your fault that the bag of Doritos gets you salivating more than usual when you are pregnant; it is difficult to keep food down during pregnancy, especially during the first three months, and salty and sour snacks are usually the only things that taste good. But these are generally not exactly great for your health, and now that you are pregnant, should you be more concerned? The simple answer is: yes, you should be more concerned. But there is no need to get unduly worried. While Doritos are not the healthiest snack options out there for pregnant women, a small bag once in a while is no cause for concern, unless you have a really complicated pregnancy, or suffer from general health issues that make your state more delicate than is the norm. Avoid indulging too much into the many flavors, though, and you will be just fine. One of the biggest concerns regarding Doritos is that it contains monosodium glutamate, or MSG as it is popularly known. The recent upheaval about MSG and its purportedly devastating side effects have sent the world into a tizzy; but, it would be reassuring for you to know that no conclusive studies are present that prove that MSG is, indeed, bad for your health. MSG is in fact one of the most abundant naturally occurring amino acids, and it is found in most naturally occurring foods. Cheeses and salty packaged foods usually contain MSG to enhance their flavor, and there is nothing wrong with consuming it in moderate amounts, as long as you are not consuming it by itself. If you are overly concerned, go for the bags that don’t contain MSG; you might have to search a while as not many flavors are available, but you are sure to stumble upon some. On the other hand, there are some very real and concrete health concerns surrounding Doritos. While it is unlikely that you will find too many in a single bag, consuming a couple of bags will certainly shoot up the sodium level in your body. You must maintain a balance of sodium and potassium during pregnancy, so avoid snacking on too many of those chips. Besides, these contain trans fats like all processed foods, and that is instrumental to weight gain. While you need to gain weight for a healthy pregnancy, undue deposition of fats can lead to complications. Also read: Can I eat spicy food during pregnancy? In conclusion, you can certainly have some Doritos when you are pregnant. All you must remember is that a pack once in a while is alright, but making it a routine is not. If you are too worried about the side effects, but cannot resist the flavor, opt for some crunchy pickle instead.